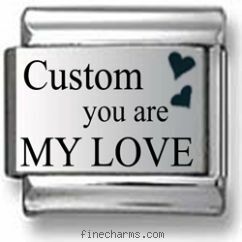 Custom You Are My Love. Baby birthstone charms. Any person's name can be inscribed onto this stainless steel charm. Whether it is your husband, wife, girlfriend or boyfriend, a charm like this speaks for itself. This charm doesn't just have to given as a Valentine's gift; simply present this special little piece any day to show your love for that special someone. If you own a Polish Lowland Sheepdog, then you know that it is lively but self-controlled, and also clever and perceptive. Now, add your favorite pet to your Italian charm by adding its name to a gorgeous photo shown here. The image shows a gorgeous Polish Lowland Sheepdog with a name of your choice running across the top. It is a great charm to give to any Polish Lowland Sheepdog owner. The Parson Russell Terrier was developed in the south of England in the 1800’s as a white terrier to drive European red fox above and belowground. Now, add this foxy pet to your collection of Italian charms and adorn it with your own Parson Russell Terrier’s name. This image is magnificently set onto stainless steel, by using a high quality stainless steel resin. The history of the Akita dates back to when the first Akita was brought to the USA by Helen Keller. The largest of the Japanese Spitz-type breeds, the Akita is a dominant, solid, well-proportioned and unique looking dog. And, if you own one of these animals, you can have this gorgeous image with your pet’s name on an Italian charm. It is a wonderful accent to your Italian charms collection.